ANDY Hey Nadia. Before the game was cancelled, who was winning, us or the GSI team? NADIA Considering the way everyone played, the score is pretty meaningless. 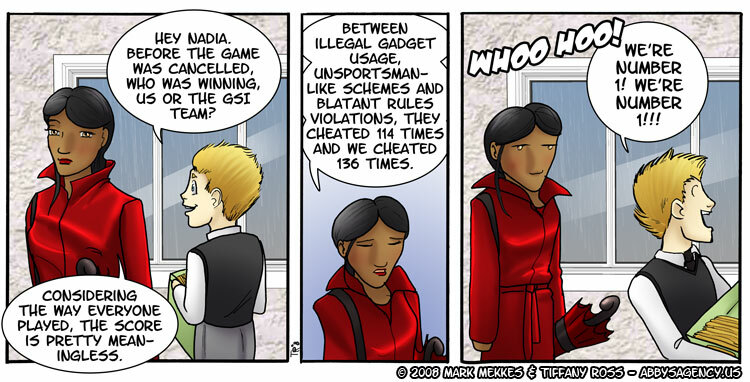 Between illegal gadget usage, unsportsman-like schemes and blatent rules violations, they cheated 114 times and we cheated 136 times. ANDY Whoo hoo! We’re number 1! We’re number 1!! !